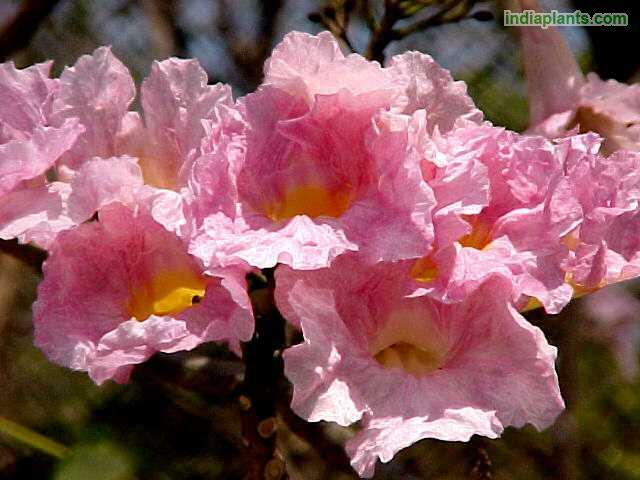 - A beautiful tall tree that blooms in flushes in spring and summer. - Rosea in allusion to the rosy colour of flowers. - Tall, erect, deciduous tree. - 20 to 25 m tall. - Small to medium winter-flowering tree, partially deciduous, with digitately compound leaves of 3-5 leathery leaflets, simple in young plants, large cluster of showy flaring tubular flowers a pretty lilac rose. - Grows on most of the soils. - Plants are quick to grow. - Starts flowering in 2 to 3 years. - Leaves fall in winter. - This is a good roadside tree and suitable for growing in parks and in medium to large gardens.